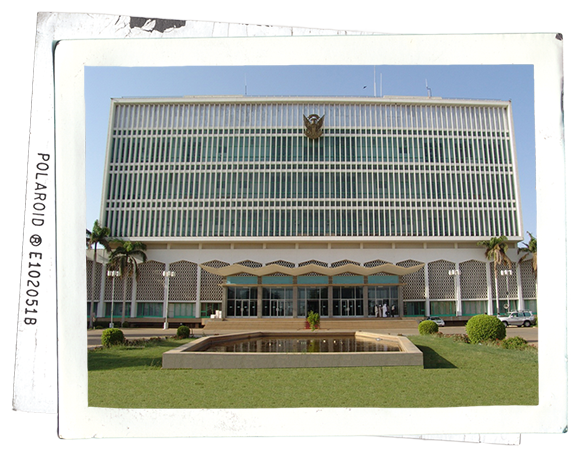 On 1 January 1956 Sudan became an independent state, with Ismail al-Azhari being its first Prime Minister. Since 1989 (1410 AH) Omar Hassan Ahmed al-Bashir has been President. In 2011 (1432 AH) the Republic of the Sudan and the Republic of South Sudan became two separate states. Usually, archaeology does not investigate the present. But we want to learn about how the remains of past eras are used today, what people think about them and how they make use of them in their daily lives. We also want to discuss the role of heritage in the present and help to present and protect it in a meaningful way. The British Empire and Egypt formally shared the governance of Sudan. On the ground, Sudan was a British colony. 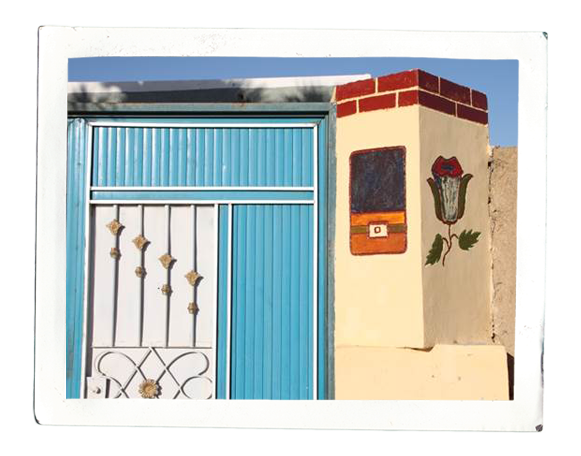 We want to trace the history of this period and its remains by building on the knowledge of the people of Mograt. We visit and study old villages with the descendants of former inhabitants, in order to learn how the people lived and worked on the island during this time. Mohamed Ahmed Ibn Abdallah, called the Mahdi, rose against the Egyptians and the British who had come to dominate Sudan. This is considered the first successful uprising of an African country against the colonial forces, leading to the foundation of an independent state, the Caliphate of Omdurman. What role did Mograt and its people play during the Mahdiya? What remains from this time on the island? We hope to learn about the history of this era and its material remains from the people of Mograt. Islam gradually spread into the region. 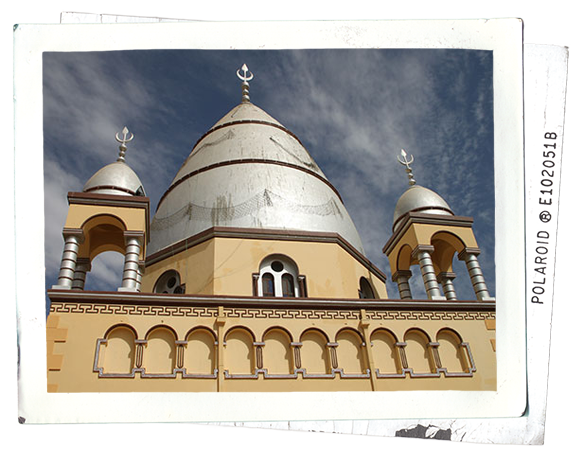 The last Christian capital, Soba, south of present-day Khartoum, was destroyed about 500 years ago. The Funj sultanate of Sennar controlled the Middle Nile Valley. About 200 years ago, in 1821 (1236 AH), the Ottoman viceroys of Egypt conquered Sudan. We think that several of the fortresses on Mograt continued to be used in this time; but it is hard to find evidence to prove this. We are also trying to trace the history of this period and its remains from the knowledge of the people of Mograt. For probably something like 800 years the people of Mograt were Christians. Several fortresses on the island date from this era, e.g. the ones in Ras al-Jazira, Maqall and al-Karmal. 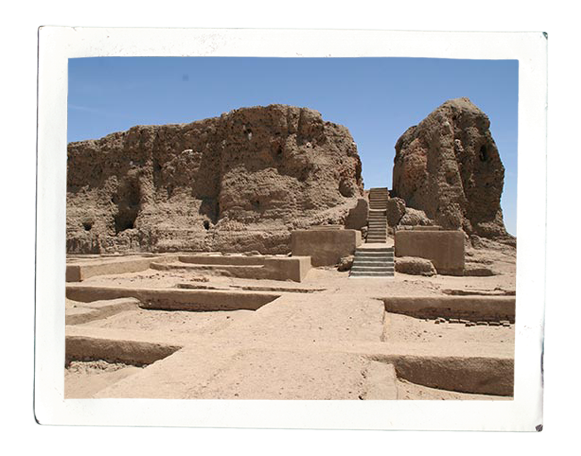 We have excavated a church within the fortress of Ras al-Jazira. The people of this period were buried in simple rectangular graves, sometimes in large cemeteries, which are often found close to present-day villages. In this era, political power in the Middle Nile Valley was split into several smaller units with local centres. 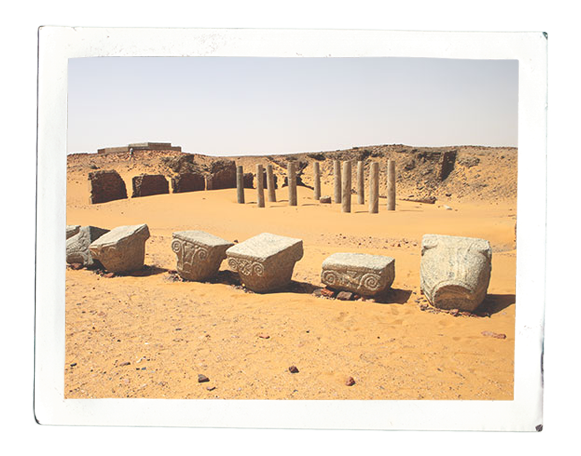 The royal cemetery and city of Meroe fell into disuse. Many of the Meroitic traditions stopped, including writing and building monumental temples. But the burial mounds of this period which dot the region often took monumental forms. People of this period also built their monumental tombs on Mograt. 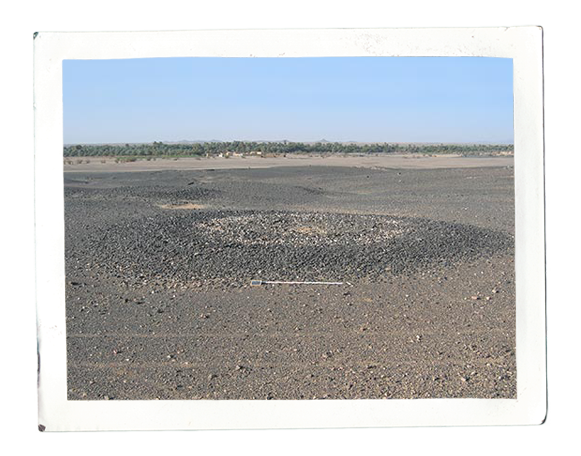 Post-Meroitic cemeteries occupy large areas, for example on the plateau above Maqall. But evidence from this era can also be found in many other places on the island. The people built simple fortresses, such as the one in Mikaisir, which offered them a retreat in these politically unstable times. 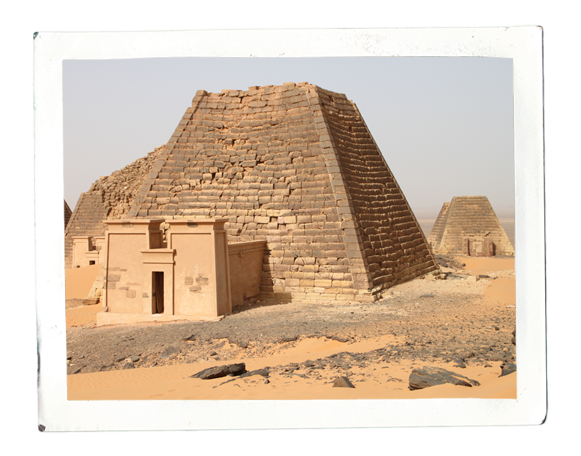 In this period, the political and religious focus was on the capital in Meroe, north of present-day Shendi. The royal cemetery moved there from the older power centres near Jebel Barkal. Arts and crafts flourished. The saqia was intro­duced, though it only became common in post-Meroitic times. The Meroitic script was developed, and the use of Egyptian writing (hieroglyphs) ended. Despite the fact that Mograt was certainly populated during Meroitic times, we cannot yet identify any sites of this era on the island. 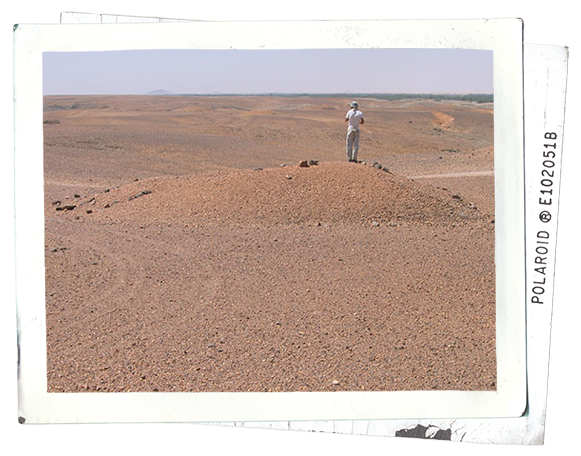 Possibly some of the cemeteries with big mounds date from this period but so far we have not found any Meroitic pottery or other typical grave goods. Local rulers came to power and even ruled over Egypt as the 25th dynasty (about 2691–2664 years ago). These rulers were called Kushites, Kush being the Egyptian name for the Middle Nile region. The Kushite kings built pyramids for them­selves and their family members. 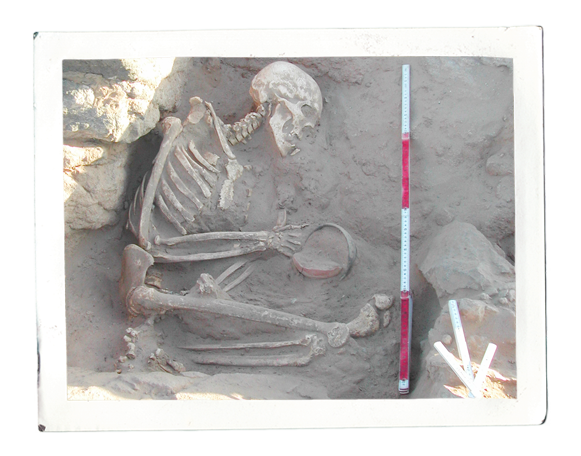 Their cemeteries are at Kurru and Nuri near Jebel Barkal; therefore the era is also called the Napatan period. We only know about the cemeteries of this period on Mograt. They are often located close to older Kerma burial grounds, but they are smaller, with fewer graves. 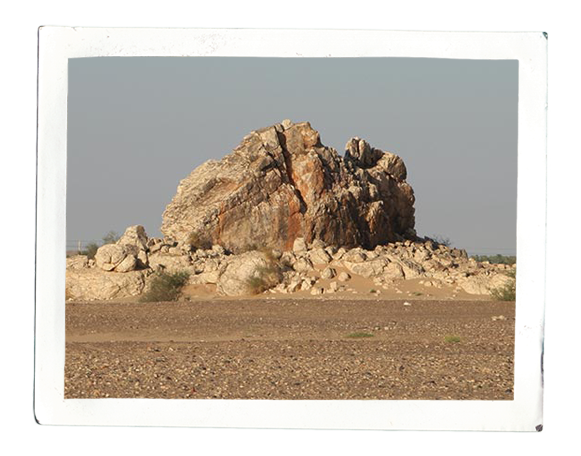 For the construction of their tombs the Napatan people often made use of natural rocks next to which they built their superstructures of heaped stones. Many of these tombs have attracted the attention of grave robbers in recent time, despite the fact that they do not contain much in terms of grave goods. The Egyptians conquered the Middle Nile Valley up to the area of Mograt – leaving several famous boundary inscript­ions close-by at Hajar al-Marwa. 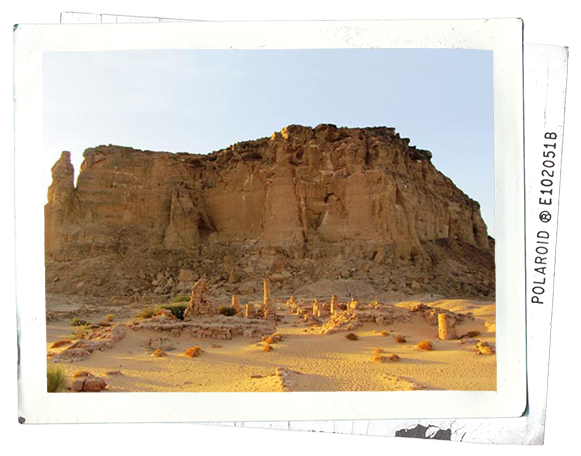 They destroyed the earlier native capital of Kerma and founded new settlements and cult centres with Egyptian temples. One of these, dedicated to the Egyptian god Amun, was at Jebel Barkal. 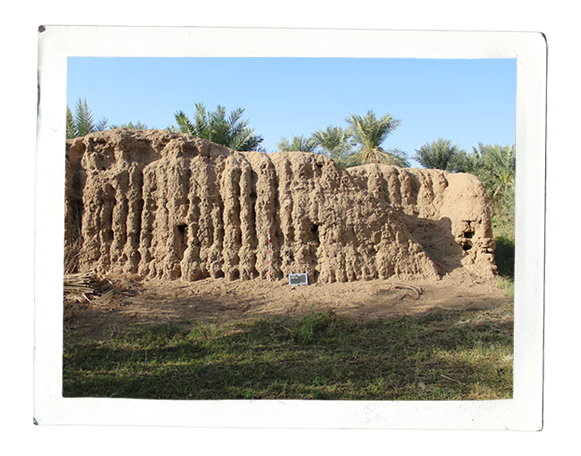 While the Egyptian boundary inscriptions can be found at the Hajar al-Merwa, some 20km upstream from Mograt on the eastern bank of the Nile, no remains showing an Egyptian presence have yet been discovered on the island itself. 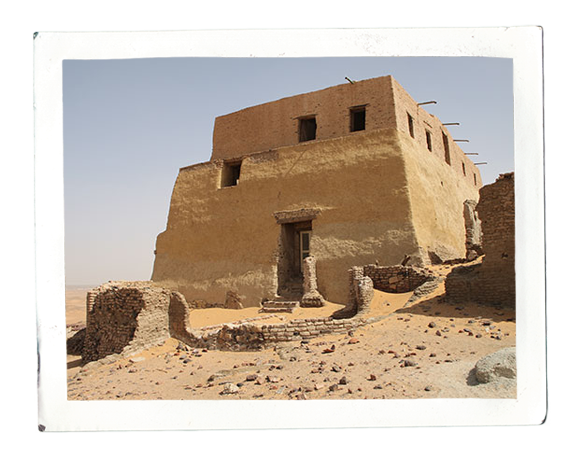 Known as the ‘first African civilisation’ south of Egypt, Kerma culture is famous for its capital with a defensive system, palaces, the enigmatic deffufa and the royal cemetery at Kerma above the Third Cataract. 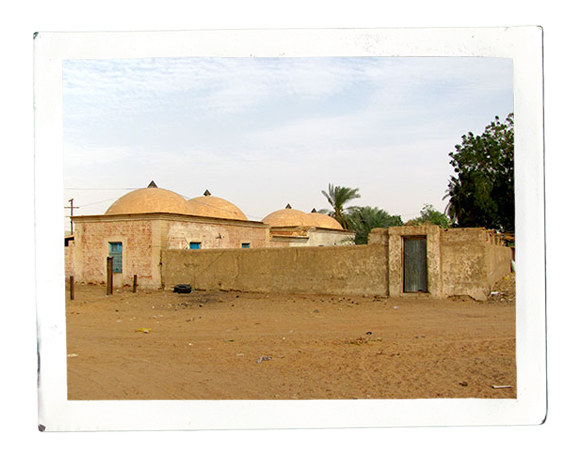 Smaller Kerma settlements and cemeteries are known from all over the Middle Nile region. Between 4000 and 3750 years ago the Egyptians conquered the Lower Nubian Nile Valley up to the Second Cataract. They built a chain of fortresses there, but later had to leave due to problems back home. 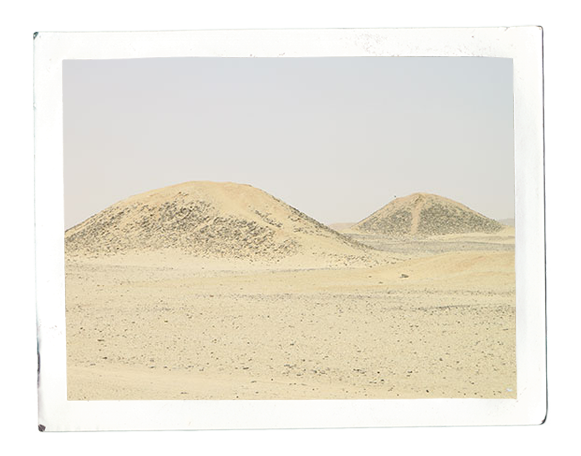 On Mograt, the Kerma people built their graves on the plateaus and ridges overlooking the arable land near the river. Their grave markers, mostly small cairns or rings of heaped stones, can be seen everywhere on the island until today. 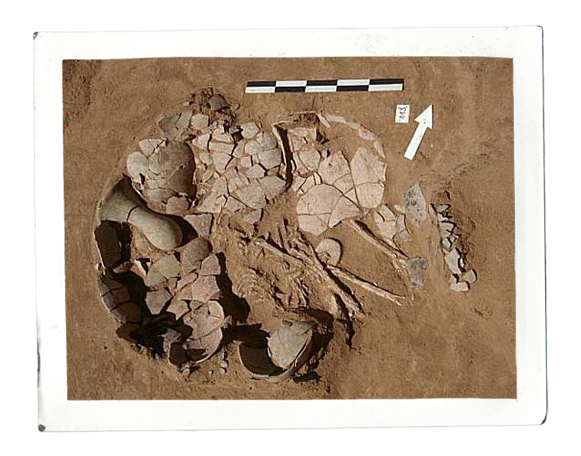 This means we know that Kerma people lived on Mograt, although we have not yet found any settlements of this period. 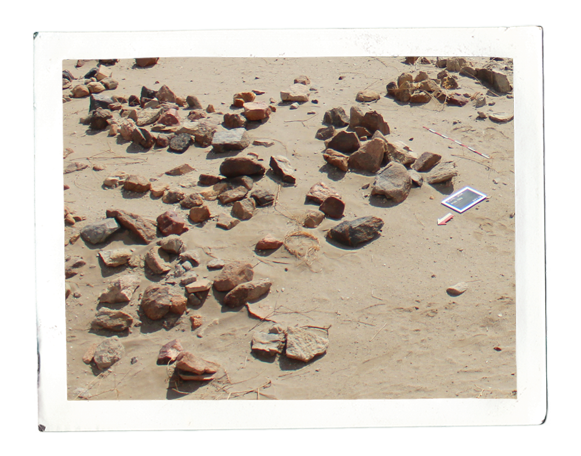 We are excavating one large Kerma cemetery near the village of al-Karmal. Many of the tombs are still intact – with a single burial in them, but with only very few grave goods. Pottery was often deposited near the cairns or stone rings. 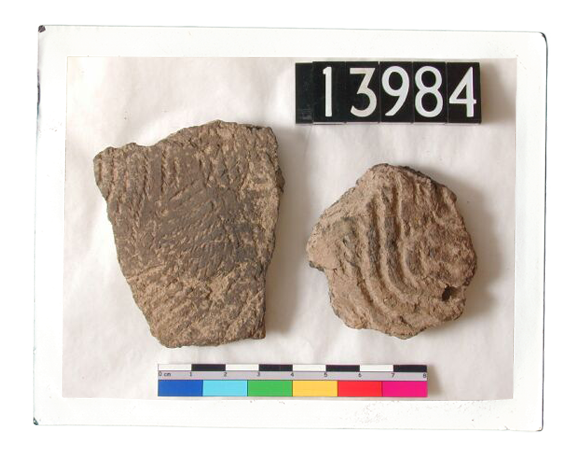 Sites of the New Stone Age are frequent on Mograt; they can be identified from the pottery characteristic for this period. Most of these sites are situated in the island’s interior. 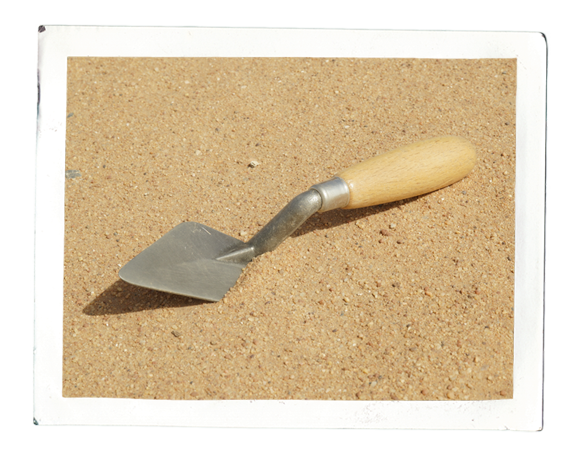 We have found places where people lived, processed food, prepared tools and collected raw material. So far, we have only identified one cemetery of this period, by accident – as it is situated on the site of a later Kerma cemetery. In this era, people lived by hunting and gathering. But they were very good at exploiting the natural resources and started to stay in one place for at least part of the year. 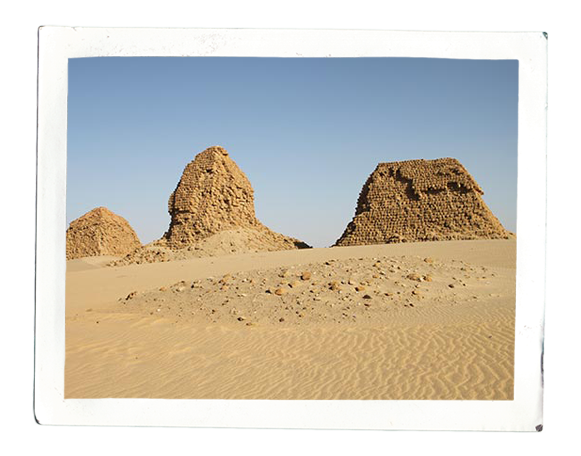 They buried their dead in their settlements and in the first cemeteries known from the Nile valley. Another important change in this period was the invention of pottery. 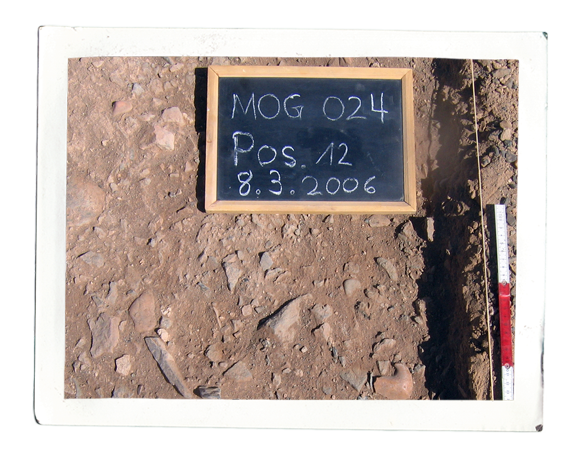 We have identified several places on Mograt where people of the Middle Stone Age lived or worked. While some of these sites are situated in the island’s interior, others are closer to the river. So far, no burials from this time have been discovered on Mograt. This is the oldest phase in human history. People – early humans – lived in small groups and moved around while gathering and hunting for food. They worked tools from stone, bone and probably wood. 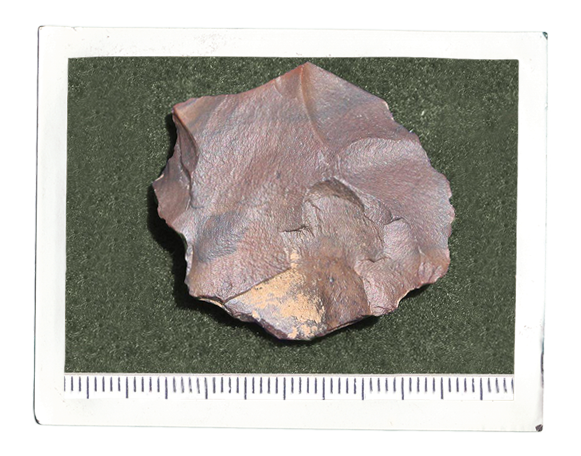 The oldest finds on Mograt date from after 250,000 years ago. 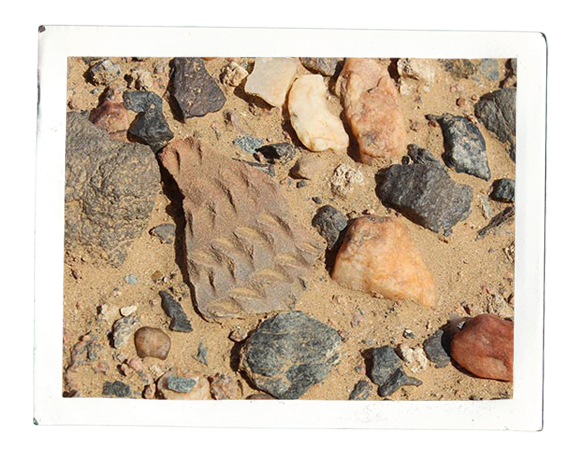 These are stone tools, still lying in the places where they had been made or used by early humans. 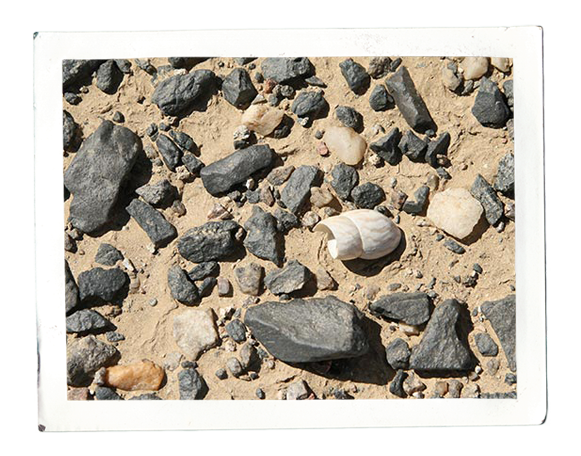 Remarkably, they can be found in many sites in the desert areas of the island’s interior.